The sauropsids ("reptile" ancestors and their descendants) and theropsids (mammal ancestors and descendants) appeared in the Upper Carboniferous (about 315 million years ago), so the ancestral amniotes must have appeared somewhat earlier. Early sauropsids were anapsid, meaning that they lacked temporal openings in the skull; from these early sauropsids we have two surviving groups, the turtles (Testudines, known from the Lower Triassic), and the Diapsida (those sauropsids that have ancestors with two temporal openings in the dermal bone part of the skull, including the lepidosaurs and the archosaurs [which includes birds], which are known from the Permian, 270 to 225 million years ago). Turtles. The turtles (Testudines) are a small group of about 250 species that are known from the Lower Triassic (240 million years ago). The hallmark of the turtles is the shell, dorsally formed by expanded ribs and expanded and fused dermal bones found in the skin of their ancestors; and the plastron, formed apparently by expansion and fusion of dermal bones in the skin and ventral musculature of their ancestors. At present there are two major evolutionary groups of turtles. One group, the Cryptodira, retracts its neck into the shell by forming a vertical S-shape in the neck. This is the predominant group worldwide, and it includes all of the turtles familiar to those in the developed world (excluding Australia). A smaller group, the Pleurodira, retracts its head into the shell by forming a lateral S-shape in the neck. These turtles are found in South America, Africa, and Australia. Turtles are remarkable because, with exceptions, they are the only vertebrates that can be picked up with impunity by humans, are edible, and have therefore been severely reduced in numbers worldwide. Pleurodira. The side-necked turtles contain 2 families (Chelidae and Pelomedusidae) of aquatic and semiaquatic turtles. Chelidae. 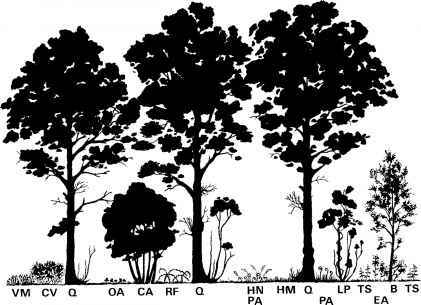 There are 11 genera and 46 species, of which 6 genera (27 species) are found in the Indo-Australian region, and 5 genera, 19 species in South America. Some of the strangest turtles are in this group, including the aquatic (and bizarre looking) Chelus, which feeds hydraulically on small fishes, and the Australian Rheodytes, which very actively pumps water in and out of its cloaca, which acts as a gill. The snake-necked turtles of Australia also have extraordinarily long necks, which gave them their common name. Pelomedusidae. The pelomedusidae (5 genera, 25 species) are, on average, more normal looking turtles than the chelids, with representatives in South America and Madagascar. Cryptodira. Cryptodira ("regular" turtles) contain several families, ranging from pelagic sea turtles to the terrestrial giant tortoises. Carettochelyidae. The pignosed softshell (1 genus, 1 species) is a close relative of the Tri-onychidae and is found in the rivers of extreme northern Australia and southern New Guinea. The shell is covered with pitted soft skin and the feet are modified into flippers. Trionychidae. The softshell turtles (22 species in 6 genera) are distributed from the eastern United States to north-central Mexico, although the bulk of the diversity is found in Africa across tropical Asia to New Guinea, northeastern China, and Japan. Although most of the species have shells of about 30 cm long, some of the Asiatic members become enormous, with shells well over a meter in length. Dermatemydidae. Like the Carettochelyi-dae and Trionychidae, the Central American river turtle (1 genus, 1 species) has a shell covered with soft skin and attains a shell length of 65 cm. The single species has a distribution from Vera Cruz, Mexico, to the Caribbean side of Honduras. (4 genera, 25 species) are ubiquitous omnivorous bottom-walkers within their range from southeastern Canada through most of the eastern United States to northwestern Mexico and south to Argentina. Most are quite small, but at least two of the species in Central America attain shell lengths to 38 cm. Some or most are capable of anaerobic respiration for considerable periods of time. Dermochelyidae. The leatherback sea turtle (1 genus, 1 species) is a pelagic turtle with flippers that allow it to "fly" through the water. The adult shell is composed of bony platelets covered by oily skin. The leatherback attains an enormous size, with the dorsal shell to 1.9 m. Like the other sea turtles, it lays eggs in nests on beaches, but unlike other sea turtles, because of its well-developed countercurrent system it is able to maintain a relatively high core body temperature, which allows it to enter areas of cool and cold water. Cheloniidae. The sea turtles (4 genera, 6 species) are widespread in all tropical and warm-temperate seas. All species are endangered to various degrees, generally because of human disturbance of their nesting beaches. Cheydridae. The snapping turtles (3 genera, 3 species) are aquatic species found in eastern North America south to Pacific Ecuador, and also in southern China and Indochina. The aquatic alligator snapping turtle of the southern United States is one of the largest turtles in the world, weighing up to 91 kg and with a shell length of 66 cm. The common snapping turtle is another aquatic member of the family, found over the entire New World part of the family's distribution. The big-headed turtle of southern China and Indochina is deeply endangered through habitat loss and hunting pressures; it is found in high gradient streams, where it will climb out on branches overhanging the water to sun. "Emydidae." The pond turtles (31 genera, 85 species) are found throughout temperate and tropical North America south to northern South America, with one species in southern South America; North Africa north of the Sahara and Europe to tropical Asia as far as the Philippines, southern Japan, and eastern China. Some of the pond turtles may be more closely related to the testudinids, so recognition of the group as an evolutionary unit is clearly provisional. Life histories of the emydids is quite variable, from completely terrestrial species (for example, Terrapene and Pyxidea) to semiaquatic (Clemmys) to large (shell lengths to 80 cm) aquatic river turtles of the Asian tropics (Orlitia). Testudinidae. The tortoises (10 genera, 41 species) are all completely terrestrial species with predominantly herbivorous diets. Although a few species reach very large sizes (Galapagos tortoises, Aldabra tortoise, and the African spurred tortoise), most species attain a shell length of no more than 30 cm; some of the species in southern Africa (for example, Homopus) are truly tiny turtles, with shell lengths of about 10 cm. Tortoises are found disjunctly in the warmer parts of North America and in the tropics of southern Central America and South America; they are also widespread in the Mediterranean region south to South Africa and across tropical and temperate Eurasia to Borneo. At least one species (Testudo horsefieldi) is found in the cold-temperate areas of west central Asia, otherwise a habitat exclusive of testudinids. and Squamates. The only archosaurs addressed here are the crocodilians. Crocodilians. The Crocodilia are an old group of archosaurs, appearing in the Middle Triassic (230 million years ago). They are the closest living relatives of avian dinosaurs (that is, birds). Although fossil members of the Crocodilia were terrestrial and in some cases cursorial, all living members of the group are semiaquatic carnivores that have taken on many specialized characteristics. Nevertheless, the crocodiles share many characteristics with birds, such as pneumatic bones, vocalization between mother and young, nest building and extended care of young, uncinate processes on the ribs, and details of the circulatory system. Most of the diversity of the Crocodilia is extinct, but three semiaquatic groups persist: the alligators and caimans; the crocodiles; and the gharial. Alligators and caimans (Alligatoridae) are evolutionarily quite close to each other. Two alligators persist, in the southeastern United States, and the other in the lower reaches of the Yangtze River in eastern China, at least the Chinese alligator being quite threatened in the wild. The tropical caimans (3 genera, 5 species) are found from southern Mexico to Argentina. The American alligator is the largest, up to 5.5 m; the other caimans and Chinese alligator generally get no larger than about 2 to 3 m in length. The crocodiles (Crocodylidae) are a very closely related group of 14 species in 3 genera. The dwarf crocodile (1 genus, 1 species; to about 1.5 m) is found in West Africa, and the false gharial (1 genus, 1 species) is found in peninsular Thailand to the Great Sunda Islands of Indonesia. There are 12 species in the genus Crocodylus, all very closely related and distributed in aquatic habitats in Africa, India, and southern China south and east to northern Australia and Melanesia, as well as two species in Antilles and southern Mexico to northern South America. The crocodiles vary considerably in the width of the snout, from broad to very narrow. Crocodiles get quite large, with the salt-water Crocodile (C. porosus) reaching 7.5 m in length. The gharial (Gavialidae) is a relict of a once-abundant group of fish-eating crocodil-ians noted particularly for its very narrow snout. The gharial attains lengths of up to 6.6 m and lives in the drainages of the Brahmaputra (Bhutan and India), Indus (Pakistan), the Ganges (India and Nepal), and the Mahanadi (India), with small populations in the Kaladan and the Irrawaddy. Lepidosauria. The lepidosaurs are an ancient group (found from the Upper Permian, 240 million years ago) and form the sister taxon of the archosaurs (which includes birds and crocodilians). Lepidosauria includes two groups of which one, the Rhyncho-cephalia, contains only two relict species, and the other, the Squamata, includes all lizards, snakes, and amphisbaenians. Rhychocephalia. This group, widespread in the Mesozoic, is now reduced to two very closely related species, the tuataras (Sphen-odon punctatus and S. guntheri), found solely on offshore islands near New Zealand. The Tuataras are lizardlike in general appearance, to about 60 cm in total length, but the details of their anatomy are quite unlike those of lizards. The Tuataras were widespread on New Zealand until the colonization of the island by humans, whereupon their commensal rats and pigs rendered tuataras extinct on the mainland. Iguania. The Iguania are a group (approximately 100 genera, approximately 1,000 species) of predominantly scansorial diurnal lizards that use their tongues as the primary prey-prehension organ. The group is divided into two quite different assemblages, the Acrodonta, or chisel-toothed lizards, in which the lateral teeth are fused to the jaw in adults. This group includes the bizarre chameleons (Chamaeleonidae) and the residue assemblage from which they are derived (the "Agamidae"). The "agamids" are widespread in the tropics of Asia and Africa as well as Australia. An evolutionary subset of this group, the chameleons, are found in extreme southern Europe, throughout Africa and Madagascar, and in southern India. Acrodont diversity ranges from big herbivores (Uromastyx) to small ant-specialists (Moloch) to the chameleons, which can project their tongues to more than a body length to capture prey. The Pleuronta are composed of the iguanians that lack the morphological derived dental characteristics of the acrodonts and so far are supported as a natural group only by molecular evidence. This group is composed of ten groups of uncertain relationship to each other. The pleurodonts have somewhat greater morphological diversity than the acrodonts, ranging from the marine and terrestrial iguanas of the Galapagos, to tiny twig anoles in the Antilles, to horned lizards, and a broad array of small scansorial insectivores. Collectively, the pleurodonts range from southern Canada to near the tip of Tierra del Fuego in South America, Madagascar, the Galapagos, and Fiji and Tonga in the Pacific. The far outliers on Fiji and Tonga are clearly part of the iguana group. Gekkota. The Gekkota (geckos and their allies) are a large group (100 genera, approximately 1,000 species) found worldwide in all warm-temperate and tropical areas. Almost all geckos are nocturnal, with loud voices, trans parent scales covering the eyes, velvety skin, and broad toe-pads that allow them to scurry across vertical surfaces. Nevertheless, the morphological diversity is large, extending from tiny leaf-litter lizards in the American tropics to giant geckos up to nearly 70 cm in New Caledonia, as well as a snakelike group (the pygopods) of Australia that are diurnal, with large scales and adapted to eating large prey. The group is cast into several distinctive families, the Gekkonidae, Eublepharidae, and Pygopodidae. Scincomorpha. The scincomorphs form an amorphous group of lizards of dubious mono-phyly that range from large diurnal active foragers to aquatic snail eaters to small fossorial and leaf-litter lizards. Within the scincomorphs are a number of families of poorly understood relationships. The Teiidae (40 genera, 245 species) are found in temperate and tropical America and includes large (to more than a meter) and moderate-size species that are fast, active foragers, as well as semiaquatic swimmers, and common sharp-nosed whiptail lizards to very small skinklike leaf-litter species. A considerable number of species of teiids have been found to be unisexual. The Lacertidae (29 genera, 215 species) are a group of Eurasian and African lizards that are similar to teiids in having large plates on the heads, being diurnal active insectivores, and having small scales on the body. Most are terrestrial or rock-living, but a few live on sand dunes. The Xantusiidae (3 genera, 19 species) are an enigmatic group of lizards superficially similar in some ways to geckos, such as in having a transparent brille covering the eye, but otherwise they are typically scincomorph. They live in cloud forests to deserts in the western United States south to Panama and in Cuba. Some species are unisexual. Skinks, Scincidae (100 genera, 1,090 species) are an enormous taxon found worldwide in temperate and tropical climes. The typical skink is a medium-size lizard with shiny cycloid scales each supported by osteoderms that make their scaly covering almost impervious to insect bites. However, the morphological diversity is huge, from many lines of legless lizards (and those with reduced limbs) to long-legged arboreal skinks in the islands of the South Pacific. Some lines have replaced their eyelids with transparent brilles; some have "windows" in the lower eyelid that allow them to see with their eyes closed, and many have developed direct internal development of the young. The sungazers, Cordylidae (2 genera, 42 species), are a taxon found solely in southern and eastern Africa. One of the genera (Platysaurus) lays eggs and is strikingly flat, living in rock crevices. The other genus (Cordy-lus) has live young, but show great morphological diversity, from relatively smooth crevice dwellers, to snakelike species with strongly reduced limbs. Some species have such heavy osteoderms in their spiny skin that they are armored. The nearest relatives of the cordylids are the Gerrhosauridae (6 genera, 30 species) of Madagascar and sub-Saharan Africa. The ger-rhosaurids lay eggs, and are otherwise more skinklike than are the cordylids. Anguimorpha. The anguimorphs are superficially similar to the scincomorphs in primitively having osteoderms in the skin, tails that break off, and in general having a skinklike body form. Some evolutionary biologists think that the snakes are members of this group, although the evidence is confusing. Eurasia; other groups of anguids occur throughout Central and South America, as well as the Antilles. Xenosauridae (2 genera, 5 species) are a small group of anguimorphs that are semi-aquatic or, when terrestrial, found in wet microhabitats. One genus is found in eastern China and the other is found in Mexico and Nuclear Central America. Varanidae (2 genera, 50 species), the monitor lizards, are considered by some to be the closest relatives of snakes. They range in size from about 25 cm to about 3 m (the Komodo Dragon). Most of the living species diversity is in Australia, but the range of the group includes sub-Saharan Africa as well as tropical Asia and Indonesia. The Gila monster and beaded lizard (Family Helodermatidae, 1 genus, 2 species) are distinctive species found from the southwestern United States south to Guatemala along the Pacific slope and are the only venomous lizards. The venom is secreted by nonmuscu-larized glands derived from salivary glands, which drain passively into the mouth, where deeply grooved teeth conduct these fluids into the tissue of prey. Human deaths have been documented by these species, which are highly dangerous, even though their disposition is generally phlegmatic. The two species range from strictly terrestrial (Gila monster) to arboreal (at least some populations of beaded lizards). baenians are very heavily constructed, and most species are heavily built legless burrow-ers, some of which will, from under the surface of the soil, attack mice and other vertebrates that are above them. Distinctive features of the amphisbaenians are a median tooth on the upper jaw and the scales of the body being arranged in distinctive rings. The Bipedidae (1 genus, 3 species) are restricted to Mexico, live in permanent burrow systems, and retain a well-developed pectoral girdle and forelegs and feet, with which they burrow. The Blanidae (1 genus, 2 species) are the most primitive group of legless amphisbaenians, being found in southern Europe and Turkey. Other than those taxa, the bulk of amphis-baenians are cast into three families, the Tro-gonophiidae of East Africa and Arabia, which have their teeth fused to the underlying bone and are the only live-bearing group; the Rhineuridae, a group with spade-shaped heads, and the rest, being cast into the obviously unnatural residue of species called "Amphis-baenidae." Dibamia. Similar to the Amphisbaenia in terms of enigmatic placement evolutionarily is the Dibamia, a group coextensive with the Dibamidae (2 genera, 10 species). The dibamids are small, limbless, attenuated burrowing lizards found in eastern Mexico and in southeastern Asia and the Philippines through Indonesia to western New Guinea (a distribution that implies a very old history). The vestigial eyes are covered by a scale, and they lack ear openings. Males have flaplike hind limbs, presumably used in copulation. It has been suggested that they are related to anguids, skinks, geckos, amphisbaenians, and snakes. Serpentes. The snakes, like the Amphis-baenia, are sometimes treated as a coordinate taxon with the lizards. That is clearly an error, as the snakes are imbedded within the lizards and should be considered just another, albeit very large (2,920 species) and diverse, group of legless lizards. The snakes appeared in the fossil record in the Cretaceous. Interestingly enough, one species in the highly derived macrostomatan group retains (or regained) legs, implying that legs were lost either many times within the snake lineage or have been regained at least once. Evidence suggests that snakes evolved from burrowing, possibly nearly blind ancestors. 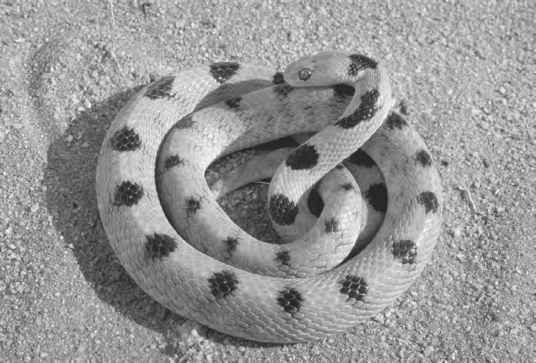 Living snakes fall into three major "flavors": those that are nearly blind and burrowing, those that are more derived but are not highly adapted for eating very large prey, and those that have highly kinetic skulls that allow them to eat very large prey, in some cases items many times larger in diameter than their skulls. Scolecophidia. The scolecophidians are three groups of primitive snakes that are superficially similar looking in the way their eyes are reduced essentially to retinas underneath the scales of the head. In the Typhlopidae (225 species, worldwide tropics) and Anomalepi-didae (New World tropics, 16 species), the maxillae are rotated to form paddles that pump ants or termites down the throat of the snake. The thread snakes (Leptotyphlopidae—world-wide tropics and subtropics, 91 species), on the other hand, have more normal maxillae and, presumably, use their jaws in a more normal fashion. Alethinophidia. The "advanced" snakes, with exceptions, have eyes that focus, and that is where most of the species and morphological diversity in snakes lies. It is composed of two groups, the Anilioidea and the Macrostomata, which differ most saliently in the level of skull kinesis. The Anilioidea have strongly built skulls reminiscent of varanoid lizards, while the Macrostomata have more delicately built skulls that exhibit a rather incredible degree of kinesis, allowing them to engulf very large prey items. "Transitional groups." This transitional collection of primitive alethinophidians is not monophyletic; it is composed of several families that have a spotty distribution around the globe: Anomochilidae (1 species in Sulawesi), Aniliidae (South American tropics, 1 species), Cylindrophiidae (southeastern Asia, 2 species), and Uropeltidae (the pipe snakes of tropical India and Sri Lanka, 8 genera, 44 species). All are leaf-litter burrowers and eat arthropods and small vertebrates. Macrostomata. Within the Macrostomata are several very small relatively primitive relict lineages: Xenopeltidae (sunbeam snakes, Southeast Asia, 2 species); Loxocemidae (1 genus, 1 species, western Mexico and Central America); Erycidae (the sand boas, 2 genera, 7 species, western North America, Africa, Arabia, and central and southwestern Asia); Bolyeridae (2 genera, 2 Recent species, of which one has become extinct in historical times, Round Island in the Indian Ocean); and Tropidophiidae (4 genera, 16 species, Central America, northern South America, and the Antilles). In addition, there are two groups of these transitional macrostomatans that are very well known to the public; these are the boas and pythons. The boas (Boidae: 4 genera, 22 species) are found in the tropics and sub-tropics of North and South America as well as Madagascar. The boas all bear living young, and although most species do not get larger than about 2 m, at least the semiaquatic anaconda of South America is the largest (although not the longest) snake, in some cases weighing 500 kg. Unlike other snakes, male boas retain "spurs," which are vestigial hind legs. A smaller relict group, the sand boas are found in western North America and West Africa (3 genera, 14 species). The pythons (Pythonidae: 9 genera, 33 species) are similar to the boas but lay eggs and are found entirely in the tropics of the Old World, including Australia. One of these, the reticulated python of southeast Asia, has been documented to grow to 11 m and has successfully eaten people. most of which are live-bearing. At least one of these, the black-and-yellow seasnake, is pelagic and has a range that extends from East Africa through the Indian and Pacific oceans to the Pacific coast of tropical America. The elapids are among the most venomous snakes on the planet, although they tend to be somewhat less aggressive than pit vipers. The Colubridae are by far the largest snake family (295 genera, 1,600 species), as well as the most poorly understood, found worldwide in temperate and tropical areas (although with only a very few and marginal representatives in Australia). They show enormous diversity, from specialized burrowers and sand-swimmers, to constrictors, aquatic fish-eaters, arboreal vine snakes, and even arboreal gliders. Although most colubrids are not dangerous to humans, it appears that primitively most groups of colubrids were rear-fanged and mildly venomous, and many species are quite dangerous to humans, particularly in southeastern Asia and sub-Saharan Africa. For most of the period of snake systematics, the Colu-bridae have been considered an unnatural group, possibly ancestral to the other caenophidians; especially implicated are the Elapidae and Atractaspididae. In recent years, considerable work has been done on relationships within this difficult taxon, and major groups are becoming elucidated. The colu-brids are composed of several groups. The "Colubrinae" is a group of about 100 genera found worldwide in temperate and tropical regions (except for most of Australia), mostly composed of nonvenomous (or mildly venomous) generalized snakes such as racers and rat snakes; considerable variation is present, however, from small sand-swimming taxa (for example, Chilomeniscus) to arboreal, dangerously venomous species (such as Thelotornis). The Homalopsinae are a small (11 genera) peculiar group of southeast Asian to Indo-Australian species that are extremely aquatic and characterized by having ribs that closely approximate ventrally. The "Lamprophiinae" are a group of 44 genera found in sub-Saharan Africa and Madagascar that are mainly terrestrial to fossorial, although a few are arboreal. The "Natricinae" include the typical harmless water snakes of North America and Europe, but their range also extends through Eurasia to the East Indies and includes many burrowing taxa and even some rear-fanged species (for example, Rhabdophis tigrinus of southeastern Asia), which are dangerously venomous. The Pareatinae represent a small (3 genera) group of southeast Asia that are specialized on eating snails and slugs. The Xenodermatinae (6 genera) are found from Borneo to Assam, India, Japan, and southern China and are composed of small, forest leaf litter-inhabiting snakes. A large group, the Xenodontinae (with more than 90 genera, found throughout the Americas) are highly diverse in body morphology, ecology, and behavior, with the bulk of the evidence of their evolutionary propinquity coming from molecular studies. The typical xenodontine is a small, nondangerous rear-fanged crepuscular snake, although aquatic, diurnal racer, burrowing, and racer subgroups are known. At least some (for example, Philodryas) can be painfully venomous. Ernst, Carl H., and Roger W. Barbour. 1989. Turtles of the World. Washington, DC: Smithsonian Institu tion Press; Estes, Richard, and Gregory Pregill, eds. 1988. Phylogenetic Relationships of the Lizard Families. Stanford, CA: Stanford University Press; Frost, Darrel R., et al. 2001. "Total Evidence, Sequence Alignment, the Evolution of Polychrotid Lizards, and a Reclassification of the Iguania (Squamata: Iguania)." American Museum Novitates 3343:1-38; Gao, Keqin, and Mark A. Norell. 1998. "Taxonomic Revision of Carusia (Reptilia: Squamata) from the Late Cretaceous of the Gobi Desert and Phylogenetic Relationships of Anguimorphan Lizards." American Museum Novitates 3230:1-51; Halliday, Tim R., and K. Adler, eds. 1986. The Encyclopedia of Reptiles and Amphibians. New York: Facts on File; Kluge, Arnold G. 1987. 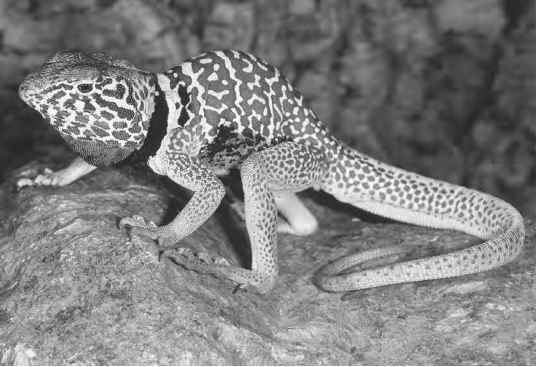 "Cladistic Relationships among the Gekkonoidea (Squamata, Sauria)." Miscellaneous Publications 173: 1-54. Ann Arbor: Museum of Zoology, University of Michigan; McDiarmid, Roy W., Jonathan A. Campbell, and T'Shaka Toure. 1999. Snake Species of the World: A Taxonomic and Geographic Reference. Vol. 1. Washington, DC: Her-petologist's League; Zaher, Hussam. 1999. "Hemipenial Morphology of the South American Xenodontine Snakes, with a Proposal for a Monophyletic Xenodontinae and a Reappraisal of Colubroid Hemipenes." Bulletin of the American Museum of Natural History 240:1-168. New York: Museum of Natural History; Zug, George R., Laurie J. Vitt, and Janalee P. Caldwell. 2001. Herpetology, 2d ed. London: Academic.